The Indianapolis Public Transportation Corporation (IPTC) is seeking proposals from qualified consultants to provide professional planning and zoning services in support of the implementation of the Blue Line (BL) Bus Rapid Transit (BRT) corridor. 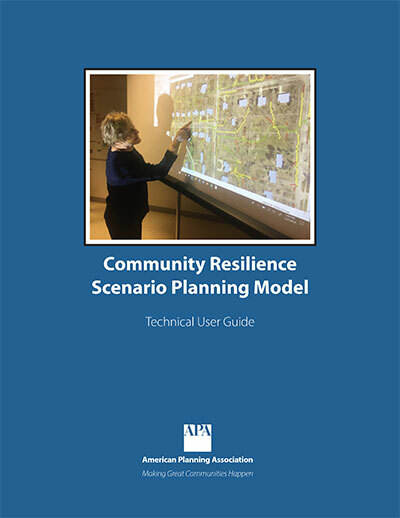 The Community Resilience Scenario Planning Model (CRSPM) described in this guide can be used in the context of an overall plan update, as part of special purpose plans, or in developing a standalone community resilience plan and implementation strategy. 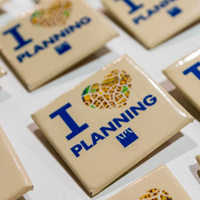 NYCEDC is seeking a consultant or consultant team to provide urban design and planning services in connection with various City sponsored projects to be specified by the Corporation and located in all five boroughs of the City. In the July 2018 issue, Planning drops in on small- to medium-sized cities that are updating regulations, revising codes, offering financial incentives, and more to support hometown retail and spur economic development. Plus oil and gas preemptions and the LA River. 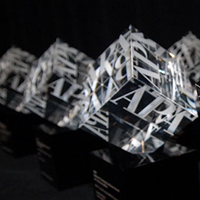 The 2019 APA National Planning Award Nomination Period is August 22 through September 10, 2018. 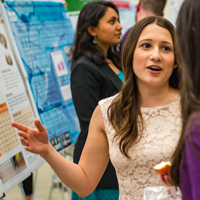 Each year, APA honors innovative individuals, plans, and planning efforts. In Viewpoint from the March 2018 issue of Planning magazine: Planners have an important role to play in immigration policy, and there are many ways we can get involved. 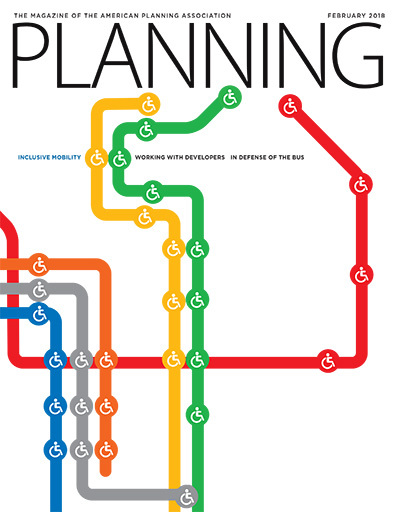 Planning magazine's February 2018 issue spotlights transportation systems based on universal design principles, examines a proven but often-overlooked transit mode, and offers five tested strategies for improving planner/developer communications. 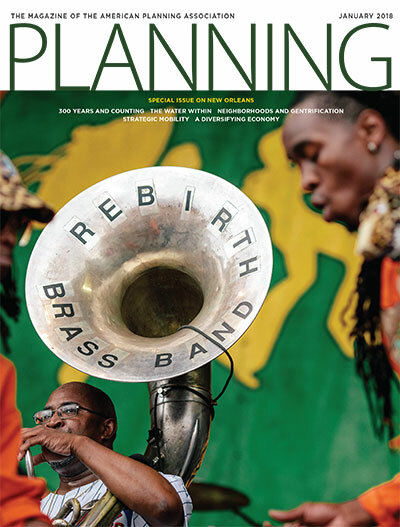 Planning's January 2018 issue takes a close look at New Orleans, host city of APA's 2018 National Planning Conference. 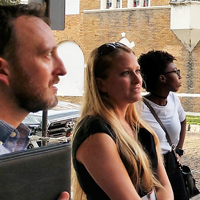 The Crescent City, which celebrates its tricentennial this year, has taken up resilience-based planning in a big way, for water systems, transportation, economic development, and more. 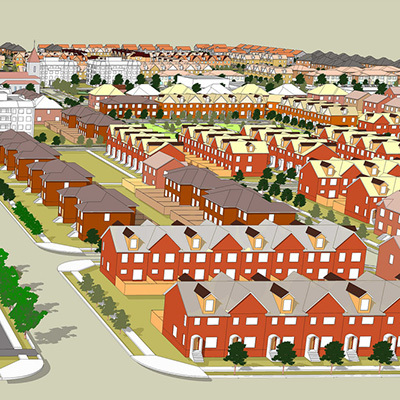 This collection catalogs resources that provide information about developing and using scenarios in local and regional planning. 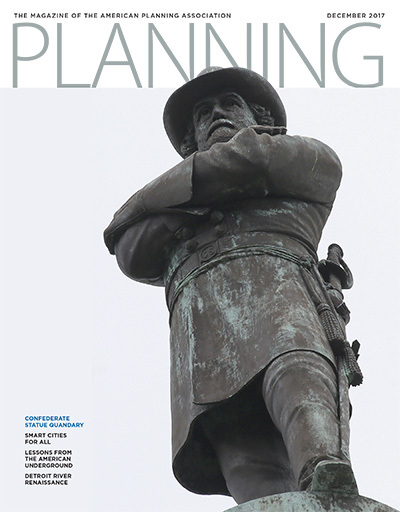 Planning magazine's December 2017 issue examines what New Orleans and other communities are doing about controversial public monuments honoring the Confederacy, while articles on smart cities, diversity and inclusion, and public participation cover exciting developments in contemporary planning in Columbus, Durham, and Detroit. 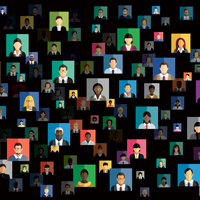 Without urban planners and planning researchers of color, we miss out on valuable perspectives. 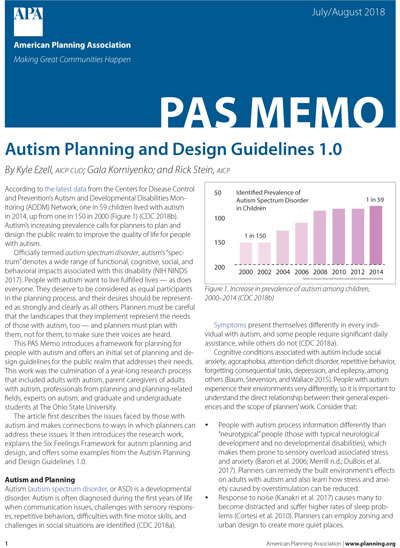 This PAS Memo introduces a framework for planning for people with autism and offers an initial set of planning and design guidelines for the public realm that addresses their needs. Planners can't answer all the questions arising around autonomous vehicles, but it’s important we ask and start thinking about them. APA’s PAS Report, Planning for Autonomous Mobility, drives that effort along. This Tuesdays at APA-DC presentation examined the Australian planning context and 21st century challenges. 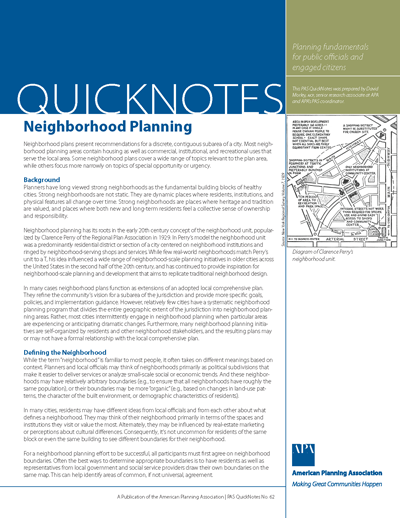 This edition of PAS QuickNotes provides a brief overview of neighborhood planning and highlights key steps in the neighborhood planning process. The Tech Zone at NPC18 offers attendees the opportunity to explore and experience new planning technology. 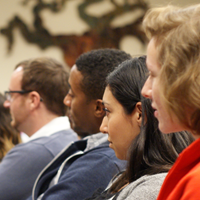 A Community Planning Assistance Team (CPAT) is working in Wharton, Texas, February 22-25, 2019. 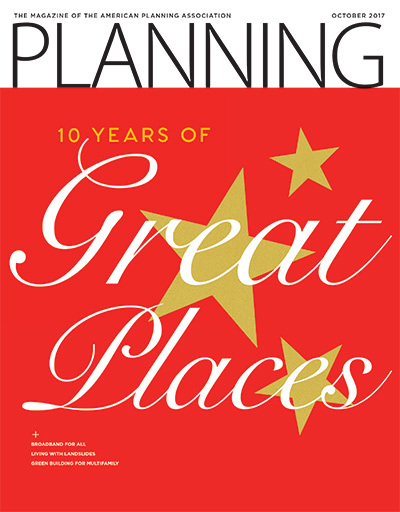 The May 2017 issue of Planning magazine reveals what's extraordinary about this year's five National Planning Excellence Award recipients and recognizes National Planning Achievement Award winners. 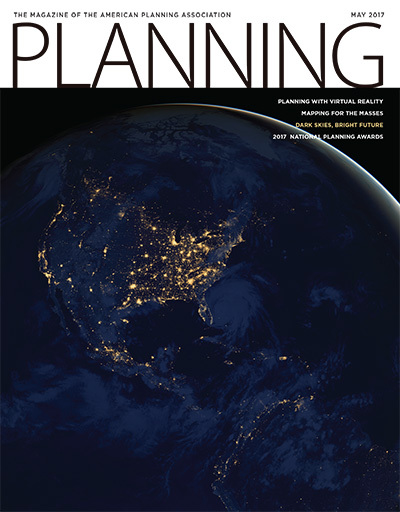 Also in this issue, breakthroughs in planning practice: new uses for immersive environmental technologies, Esri's Green Infrastructure Initiative, and efforts to diminish urban light pollution. In the October 2017 issue, Planning recognizes the 10th anniversary of APA's Great Places in America program by revisiting many of the streets, neighborhoods, and public spaces. Did APA recognition help their communities and raise the profile of local planning? Also, broadband, landslides, and passive house standards. 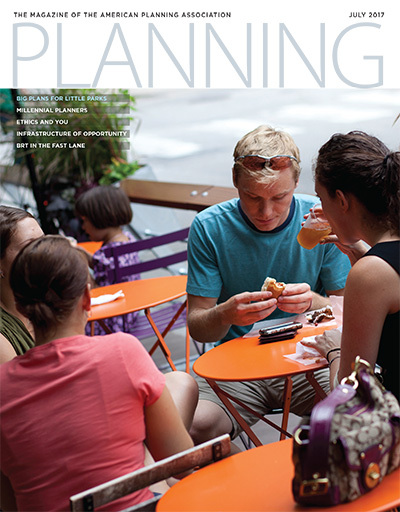 Planners routinely create plans, reports, and guides. 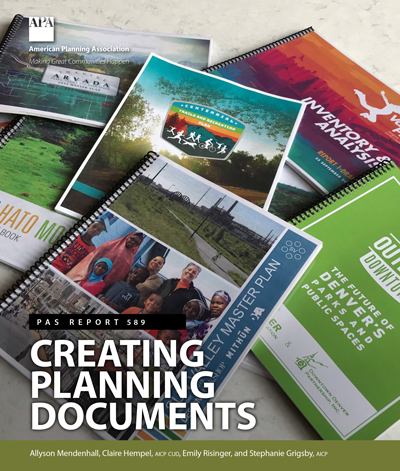 This PAS Report is a guide to recommended practices, including field-tested tools and strategies to help planners manage the process of creating planning documents from concept to delivery. 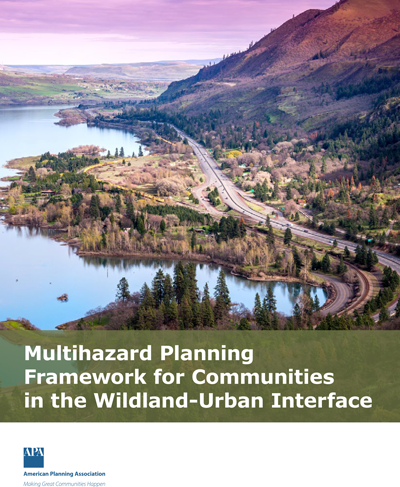 This planning framework and the accompanying planning systems audit tool are designed for use by planners working in or with communities located in the wildland-urban interface (WUI). 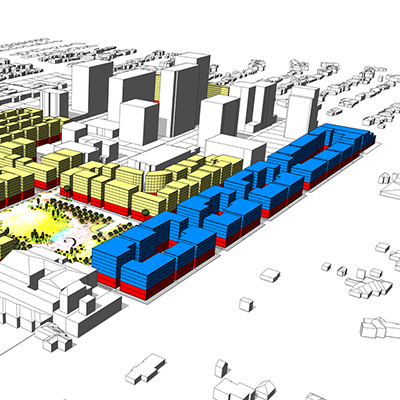 This collection catalogs resources that provide background and policy guidance on planning for discrete, contiguous, predominantly residential subareas of cities, as well as examples of locally adopted neighborhood plans. 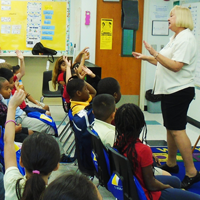 APA Ambassador Kimberly Glas-Castro, AICP, excites students about planning as a career choice. 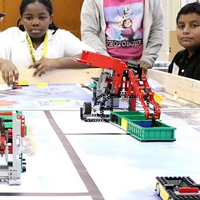 University planning programs need to formulate new approaches to education that connects students to their local communities and incorporates innovative technology. 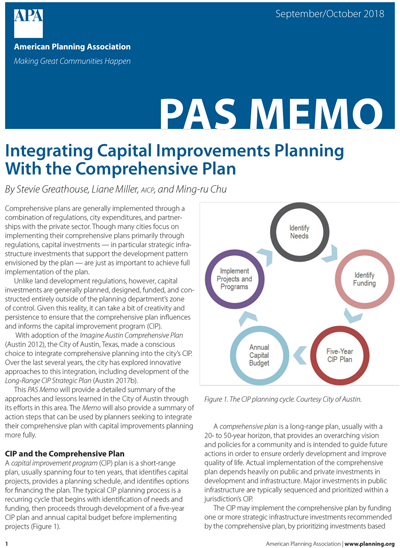 This PAS Memo explains how the City of Austin, Texas, developed a new model for the capital improvements program planning process to better involve planners and integrate comprehensive planning into the CIP. APA National Planning Awards Jury Chair W. Shedrick Coleman hopes to see more nominations from smaller and mid-sized communities. 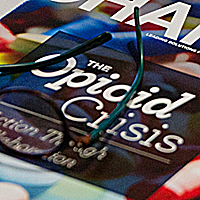 Let’s make 2018 a year of advocacy for good planning, says APA CEO Jim Drinan. 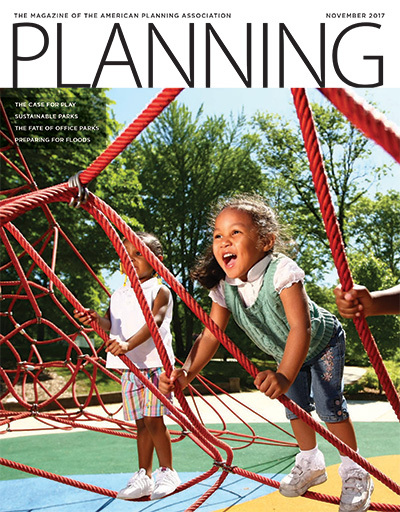 Parks and play spaces get double coverage in the November 2017 issue of Planning. 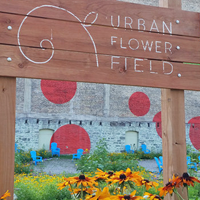 "A Case for Play" visits pioneering playgrounds, while "Nurturing Neighborhoods" explores the many benefits that that well-planned urban parks convey to their surrounding communities. Also, flood preparation and suburban office parks. 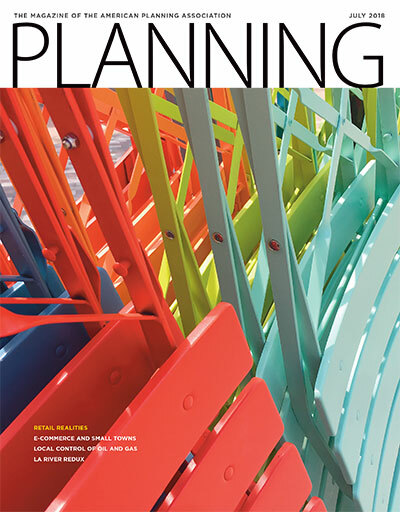 In the July 2017 issue, Planning magazine examines how the profession is getting a major refresh as a new generation of planners — with a new generation of ideas — moves in with gusto. Also, planning ethics, bus rapid transit, parklets, and Chattanooga, Tennessee.